It’s that time again! April marks the birthday of Blog.SpoonGraphics, with this year being the big number three. Long time subscribers might remember the two year commemorative post, the one year post, or maybe even the six months post. Let’s take a look at the latest growth stats and see what’s been going off behind the scenes. The majority of traffic now comes from Google searches, with Illustrator Tutorials, Spoon Graphics and SpoonGraphics being the top keywords. 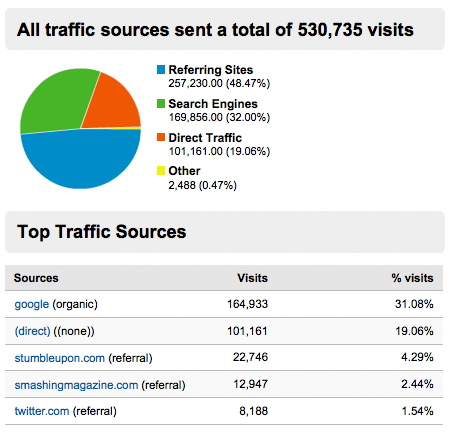 Direct traffic comes in second, StumbleUpon third and Smashing Magazine fourth. 2009-2010 saw a few new changes to the site. Firstly there was redesign number five, which saw another complete overhaul of the theme. Since 2007 I’ve kept the same ‘design’, but have added extra touches here and there and evolved the design every time. I also recently introduced the members area to the site which is coming along really well. There’s already a bunch of useful resources and discounts that members can get their hands on, which makes it easy for members to recoup their $7 membership cost. The great thing about this model is that as time goes on the value for money only gets higher and higher! I’m still being amazed at what opportunities my blog has brought me. Since last year I landed a position and a co-author of the Smashing Book; I was invited to London for the NET magazine awards; I’ve made a few more appearances in design magazines; I had the pleasure of participating in lots more online interviews; and I’ve been lucky enough to have been able to cut down on client work and concentrate on working as a full-time blogger. As my blogs continually grow, the demand for more robust server setups also increases, especially now I have Line25 with an ever growing appetite for CPU and RAM biscuits. I recently had trouble with large traffic influxes on post days killing the server, even with 4GB RAM to eat through. I had trouble with various caching plugins in the past, with each causing crazy side effects that caused havoc elsewhere on the site. I’m currently using Hyper Cache, which does a great job of reducing server load, although it does have once side effect that I need to address where new comments aren’t redirected properly. It’s pretty much common practice nowadays to celebrate your blog’s birthday with a poster, so I decided to create a special design for Blog.SpoonGraphics’ third year. I have three copies of the aptly named 3 poster to give away. To be in with a chance of winning one for yourself, just add a comment to this post by Friday 16th April 2010. I’d love to hear some interesting insights that relate to the blog, such as how you found it in the first place or what your most favourite post has been from the past few years. Also, stay tuned for a ‘making of’ post that takes you through the process of how the poster was created from sketch to final design. Everyone who has subscribed, tweeted, voted or stopped by to check out an article over the past year gets a huge thank you from me. I hope you all stick around for the next 12 months, and I hope the upcoming posts and topics come in handy! 262 Comments submitted Add yours! I’ve been an avid reader of your blog for about 2 years now. Your tutorial on building a single page portfolio helped me gain a place on a graphic design degree course. I gotta hand it to you Chris, your blog really helped me out! Congratulations on making it 3 years! You were one of the reasons I started D-Lists and if I can manage a small amount of your success, I’d be very happy! I ve been following your blog for sometime now….and there’s barely any post that i did not completely love! Although my all time favorite was your post on your logo design process for the logo of Vivid Ways. That was highly insightful and had changed the way i design logos. My logos looks much better, all thanks to you. came to know of this site via smashing mag when i wanted to read up more on wordpress and illustrator stuff… and totally lovin it. Happy birthday! No wonder you get that amount of pageviews, ’cause your articles are really great. Keep up the awesome work Chris, Love the poster by the way! I am pretty sure I have had your blog in my Reader since two to three years now. Next to the Envato sites and Smashing Mag. this is the place I go for tips, tricks and inspiration. I have yet to commit to your premium stuff though. What would it take for me to become a premium member? In general, something fresh. For instance, how about some Illustrator Photoshop infographics tutorials? Or Illustrator InDesign stationary-branding-letterhead-booklet design tutorials? I would luv to see more tuts for print design. Kudos btw on that awesome resume/cv tutorial you did some time ago. Congrats with the 3 years! The “How to Build a Custom WordPress Theme from Scratch” article was great, and I’ve shared that so many times. I’m actually in the middle of designing my own WordPress Theme and that article has helped so much. I really enjoy reading this blog! Thank you Chris for all your hard work, you definitely inspired me to have the ambition to become a graphic designer! Congratulations on 3 years and some fantastic stats! I found this blog through Twitter and it’s become one of the first places I come to when looking for design advice. Thanks for all your hard work! Great progress and success you’ve had. Nice poster design too. Fantastic success you’ve had with the site, I’ve used a few of your illustrator tutorials, they came in handy. Very nice poster design too! Since a year or so, I’m an avid reader of your blog. The first time I passed by your blog was via Google. I was looking for Illustrator tutorials. Since the day I’ve found it, I bookmarked it. My favourite tutorial at the moment is ‘Create a Rolling Stones Inspired Tongue Illustration’. But that won’t say that I don’t like all the other tutorials. Since I’ve found your blogs, I definately want to become a designer. And further: Happy birthday Blog.spoongraphics! Enjoy your 3th birthday! Thanks to Google (I guess I was looking for something like ‘Illustrator tutorials), I heard about your awesome blog about 2 years ago! It’s been great reading your blog! To many more year! I just recently began doing some freelance design work, and sought out a bunch of different blogs (including this one) to help/inspire me in my design. My girlfriend and I both really like your post titled “Twitter Background Design How-To and Best Practices.” She works for a small non-profit, and we’re going to use some of the tutorial steps to help create a unique twitter account for her work. Gz on 3 years old! Love your blog! Its a great source of inspiration for me! I started reading your blogs a few months ago and it is a decision I have and will never regret! Happy Birthday! Dang Chris you’ve come so far bud. Looks awesome seeing the blog blossom from scratch. I discovered your site I believe from the tuts network a long ways ago; probably on vectortuts or something. I think some of my favorite tutorials happen to be your character (monster, scientist, etc) illustrations because illustrator isn’t one of my strengths in design. Plus you’ve given some good tips on saving time and shortcuts I didn’t know about. Keep up the killer work and congrats. 3 years is an amazing achievement! I guess it’s the success of the blog itself rather then it’s age that should make you most proud! 15k+ hits a day really says alot! and i know (i been one) there will be alot of those 15k who visit daily to check on updates! Thanks for all the help! and good luck with the next 3years and beyond! Congrats Chris! I wish you all the best with SpoonGraphics! It truly has been an excellent 3 years, love the site, and a big Happy Birthday! Congrats on turning 3, keep churning out the good stuff! I’ve been following your blog for quite some time now, and I love all the inspiration! Congrats! I love the “Cute Furry Vector Monster” tutorial, the “Cool Vector Panda Character” tutorial and generally every Vector tutorial you are adding here! I enjoy your posts and am especially glad you bought a Mac last year. It’s awesome isn’t it? Keep up the good work, and take care. Hey Chris! All the stuff yu produce here is just great. I always enjoy very much every single one of your posts, hope you’ll be able to stay with us for another year. As for the content itself, I haven’t been able to find better illustrator tutorials anywhere else. Your blog it’s the first place I go when I look for great illustrator tuts. It’s also the first place I recommend anyone who turns to me for support with learning illustrator. I’ve enjoyed your site very much and I’m especially glad you bought a Mac last year. Isn’t it great? Keep up the great work and take care. Can’t really remember how I found this site, it was during those crazy times when I started using an RSS reader. First of all, happy 3rd birthday! I cant remember how i found your site. Love your posts both here and over at Line25. Keep up the great work! I am sure that poster will look great in my room, if i win! It’s been a fantastic 3 years Chris. To see someone from my hometown grown into an design icon is fantastic and really does give me hope for the future that others (hopefully me :) ) can follow your example and produce some really good work to be proud of. I’ve always loved your PSD to HTML tutorials and especially the nifty ones on illustrator. I couldn’t give you a favourite post because there are just too many. Happy birthday to the site and heres to the next 3 years, I think they will be great for you and all the readers! Congrats on your 3rd anniversary, Chris. Your site is a great resource and inspiration for many others. Best wishes as you push forward to year 4! Absolutely love your blog, Chris. I have been following it for some time now and just can’t get enough. Love the site, hopefully it’ll still be around for many more years! Great, Chris. Thanks for your work, for your sense of humour and so on. Thanks, and keep on the work! Working long hours at a bank, earning the responsibility of designing our intranet, needing some good resources to make everything look nice! ALSO – It looks like we share a birthday! Mine is today! Happy birthday, blog.spoon! I havent been a spoon graphics reader for very long but am really enjoying the informative articles. Great giveaway! Happy birthday BSG! I enjoy your simple quirky illustrator tutorials, and your weekly recaps…. Great! I love this website! This blog rules!, I read it everytime I need a tip or there is a new post!, I’ve been reading here since 1 year! Congrats on three years. Keep up the great work. Great stuff! Keep it coming!! Happy BDay! You’ve been in my RSS since I learned that they existed. Before I started doing visual design I got an architecture degree. Your poster reminds me of long nights in studio with charcoal-blackened fingers. Happy bday to the blog and bravo for all work done! Congrats for the great work and excellent blog(s). Thanks to you and this blog i’ve learn a bunch os stuff that you don’t learn at school or books. This is a real designer’s experience that he gladly shares with the community. I hope you keep doing it for a long time. I’ve been following your blog for the past year now and I love it. I originally found it while looking on the internet for illustration tutorials and I fell in love with all the original content. This is a blog I can always trust to provide high-quality content for an illustration major like me or anybody interested in art and design. Happy Birthday, thanks a lot for the inspiration u are giving. Wishing u the best always. Comparing to blog.spoongraphics.co.uk to my blog visit status is light years away, but many of my visits are referral from this blog. Thank you Chris. I’m amazed at the kind comments so far, thanks everyone! I first stumbled upon your site through a “upcoming graphic artists” list, and I’ve been hooked ever since. You always make everything seem so effortless. Keep doing what your doing Chris. You rock! Been an avid reader of this and your other blogs for some time. I think the most interesting blog ever was the one about the green IKEA shower curtain for video effects. My fmily have leanrt not to ask why I was buring a lime green shower curtain! Congrats on the 3 years Chris! Wow. I remember coming here for the first time in later 2008 looking to learn Illustrator. I still look at the monster vector tutorials, the quality still remains extremely high and that’s what I love. Even with two fantastic sites, they both are still tops in my feed reader! 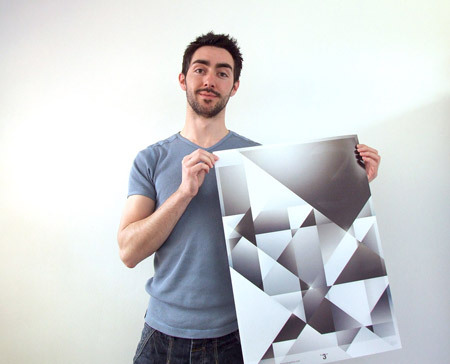 Quick question – what did you use for the background and lighting in the photo of you holding the picture? Its always a delight to read your posts Chris. Happy 3 years! WOW the site has really grown in the past three years, congrats! I’m a German reader of your site (sorry, for my bad english :( ). You website is very interesting and I hope you’ll write more interesting posts and great tutorials in the future! Congrats! 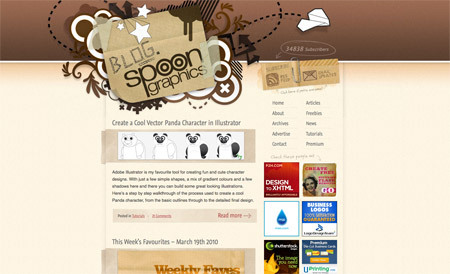 I like how blog.spoongraphics.co.uk has evolved over the years. Stumbled upon your site a while back and I love it, i’ve checked back regularly ever since. I have been following your incredible blog for ages now and have found countless inspiration in your work. Your work on VividWays made me drool! Such an incredibly logo. To this day, I still refer to that logo for inspiration as it’s so beautiful. Keep up the great work mate! I just recently found your site and it’s tottaly awsom! congratulations on the 3rd year anniversary. Would love to have that poster at my office! I wish this blog a great life ahead of it, would love seeing more tutorials! Happy 3rd Birthday! Keep up the great tips and info. I don’t remember where I discovered this blog. It’s been at least one, two years. But this blog has helped me a lot so far. The tutorials you write are amazing. 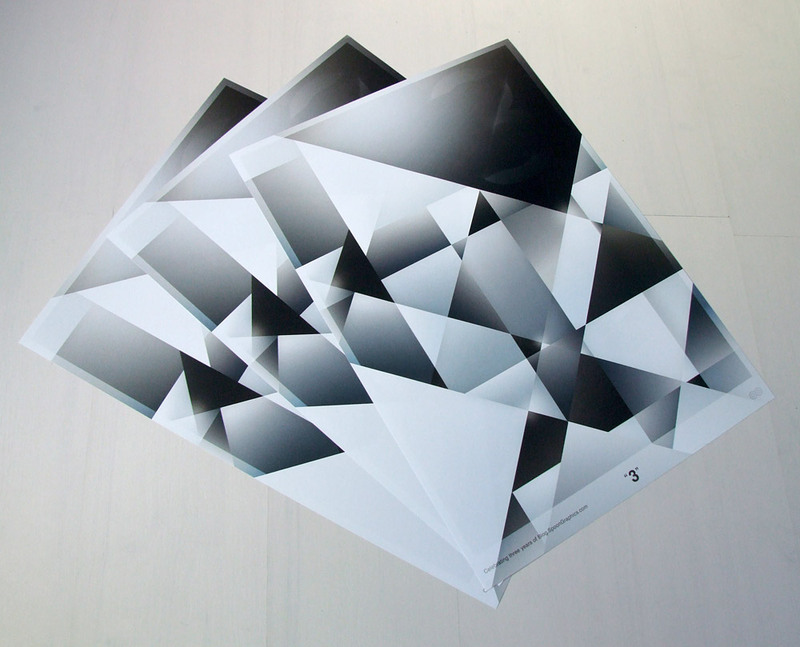 I am a german mediadesigner and find this blog very good. The tutorials have helped me me in the vector graphics and programs on trainees. In short, I am a big fan and hope this blog continues to remain so. I am a German media designers and find this blog very well. To be honest, I don’t remember how i came across your blog, but I sure am glad I did!! It’s been a while now that blog.spoongraphics AND line25 give me weekly inspiration and ideas. For that I thank you and hope you continue the hard work! I really enjoy your little characters and monsters. I think they’re very creative and fun! Surely they get along in their own little universe. I think my first exposure to the site was in a search for Illustrator tutorials. Here’s to more success in the future. Keep doing what your doing and I will be sure to stick around! Your doing a great job! After I got out of the hospital, your website helped a lot to figure out concepts and expand on my own ideas. I hope this blog lasts a long time. Wow, three years? I remember finding your site waaaaay back when my main site was also in it’s infancy. I believe I came across the site through a CSS Gallery (sorry, don’t recall which!). Congrats, Chris – you’ve done a great job with all your sites, and we all look forward to seeing more great things in the next three years! Great work, I am really happy for you! I just came upon this site today, and found that it’s great! Interesting stuff, awesome posts, this is now definitely one of my most visited sites!! Happy 3 years Chris. I have been following you (on here, line25, and CS.com) since pretty much the beginning of all three sites. Congratulations!!! Nice stats… I wish I was able to get something like that in three years. My fav post of is 50 Illustrator Tutorials Every Designer Should See. I’ve bookmarked it and visit the page often to look up tips. Google sent me your way, and I haven’t left since. love your blog, congrats on 3 years! Congratulations. Your site has come in handy more than a few times over the past year or so. Glad to see you’re still plugging away at it, and of course helping me along the way! Great work Chris. I’m planning on teaching myself photoshop and your site will definitely help me in the process. Thinking about making a blog out of it in the process. Happy B-day!! April keeps getting better! Well how i found this place…soon as i got photoshop and illustrator i wanted and need tutorials and this was one of the first place i clicked on, and thanks for all the content, very helpful for a rookie like me. oh and just for kicks, my B-day is April 13th!! I’m a young italian graphic designer, working for a small italian software company. I found your blog searching in Google for Illustrator related tutorial and so on…and never left you! Visiting your blog once per day, my favourite page is your tutorial about the Rss Icon…it was my really first step with AdobeIllustrator! Thank you for all these great emotions! Happy birthday! I just love your site. It´s my favorite blog here and I´m still looking for such a german blog with that quality and activiy. Keep work Chris! I hope for 3 more interesting and successfully years of blog.spoongraphics!!! Keep it up and thanks a lot for your effort and work you put in this blog! Stumbled on your site through google and I think its brilliant! Well done on 3 years – here’s to many more! Hi Chris, Happy Birthday blog.spoongraphics! I love to read this blog, each new post is a real pleasure to read, i’ve learned a lot of things thanks to it, and i hope i will learn again and again, best wishes for the future. I’m a relatively new subscriber but I find your work very creative and inspiring. Great stuff Chris! p.s. I *think* I’ve just set up my Gravatar. Wow, happy birthday. I remember the early days of blogspoongraphics, man that is 3 years ago! TIme flies when your a freelancer! Congratulations on the 3 years, I cannot imagine how much you paid to get Simon Cowell to hold that poster for you! Congrats on 3 years! This is one of the few blogs I find not only interesting but also helpful with pretty much every post. There’s always something new and useful. Keep up the great work! I first came across your blog on a link to a list of Illustrator tutorials. I then found that a lot of the tutorials I wanted to check out were coming from you! From following your blog I’ve learned a lot about the business of freelance graphic design. I’m just starting out, but I feel as though I have someone with experience to look up to! Hey, well done on hitting the 3 year mark! Can’t quite remember how I found your site but it was at least two years ago. I had an apprentice working under me at the time and gave her the link to the monster series that you had with the blob and the octopus etc as she’d never used illustrator before, has to be said, she’s a dab hand at it now!! I would like to help, but I met the blog since so long that I don’t remember how I got here, the truth is since I came here the first time, I step by very often because this is where I see the best tutorials from the internet. Happy Birthday! Been a reader for over 2 years now. I have to say your post on how to create a WordPress theme from scratch has been my favorite one so far. Invaluable. Here’s to 3 more years! Keep up the great blogging! I’ve only been around for about half of your 3 years, but I’m looking forward a bright future together. You’re fresh, informative & fun. keep up the great work. But where is ur old blogroll?? Smth i want to read websites like urs.. but i dont know what is better. I think u must write a post about websites u read. Sorry for my English.. I’m from Belarus! I really love the site design. I am a new reader of the blog/site and I really love what I have seen so far :] I am really excited that I have found this site, and it has been bookmaked as one of my daily reads. Congrats on the Bday celebration! Nice poster too by the way! *carries a huge cake with 3 lit candles* Ha-ppy Birth-day to yoooou! Ha-ppy Birth-day tooo yooou! I love your site! First time I stumbled on it was when I was searching for Illustrator tutorials. I always have fun trying to go through the “Create a…” tutorials. Keep up the great work! Statistics are always fun to watch. Just curious though, what’s with the 0.47% Other traffic sources? I never knew there was such a label in Analytics. I live in Vietnam, accidentally learned of your blog and I enjoyed. I learned a lot. Very happy to be acquainted with you. hey, i’ve been reading your blog since Stumbleupon sent me here just over a year ago. Your information has been more helpful than I know how to tell you! I still refer back to your post “Business Card Design Project Walkthrough” often to help me get on track when i feel like i’m faltering! Keep promoting your blog anywhere and everywhere you can! that’s a good looking poster! Nice post, interesting things about this blog and I’ve just seen the older designs :P. Well here’s my story about Blog.SpoonGraphics. I don’t remember where I found this excellent blog but I think it was in Abduzeedo. When I read it for the first time (8 months ago) I was stunned with the beautiful design and with your amazing work. I’m not suscribed, I must say u.u but I’ll do it right now. This blog is Bookmarked in my PC and my laptop :P and I check it everyday. You’ve inspired me and my work and I hope the best for you. Keep doing that great job and sorry I forgot to send you the interview, I have to translate it ’cause is in Spanish :S.
Love the site. I first stumbled upon the site when another site posted a link to the 3d cutout Frankenstein project. Been visiting ever since. That still is one of my top tutorials on the site. Would love to hang up that poster in my cubicle. Needed help with Illustrator tutorials and found you! Thanks for all that you do.. Happy Birthday… Thanks for the quality work and articles. Happy 3rd Birthday Chris. I have really enjoyed your blog over the years and 3 years is no small feat. You’ve written some really memorable tutorials, and have a unique look that makes your blog stand out. Here’s wishing you another great year. Congrats ! your blog help many users like us even new bloggers :D — Keep going UP !! You are one of the main bloggers that I follow. You always write about a nice variety of things and do a great job. Happy 3rd birthday. Keep up the awesome content. Good website dude! Pretty like your stuff! Wow! That’s an awesome poster to win! Ok, I have a confession to make: I nearly ripped off this blog’s design… well, sort of. I was doing a mock-up of a design last year for a friend’s online course module (to complement her “actual” classroom lessons) and was searching for some tutorials on how to do a certain design technique. I’ve forgotten already the actual post I came across with, but Google pointed me here and it was love at first sight with this blog’s design. Well, I didn’t actually copied the design per se, but I got inspired by the way you used paper/cardboard texture and with the design’s color scheme that I have employed them as a sort of jump-off point for the design I’m doing. I was really obsessed with the details you have put that I even used the actual paper clip image in this blog’s header for the mock-up as I can’t find the perfect clip image anywhere! Wow, Happy Birthday from Spain!!!! I didn’t found Blog Spoon Graphics but HE found me. Searching in the web, reading my RSS, I can’t remember exactly the first time I read this great site, but I know he revealed me their brilliant posts in an unusual way! And since that day I read your articles always I can, finding out that you always improve the day before’s post!!! Awesome! Congratulations and good luck!!!! Happy Birthday! Congrats Chris. Amazing blog. I can’t exactly remember how I came across your blog, however, I can remember yours was probably the first one I started following! I originally found your site looking for illustrator tutorials and liked the rest so much, I come back almost every day. Great Poster, and Happy Birthday! As a budding graphic designer, this site has taught me almost everything I know about Photoshop and Illustrator. Thanks for all the great work! Congratulations and a VERY BIG THANK YOU. You provide such an amazing resource to graphic designers around the world. So much great content. We are indebted to you. thank’s for presenting inspiration for our life, chris. and happy birthday for blog spoon graphics. I’m a daily-blog-visitor since round about a 5 months. It’s great, I love it!!! Congratulations on your third birthday! I don’t even remember how and when I found out about this blog, but was quite some time ago – actually one of the first blogs I was checking out when I got started with the whole “design” thing. Thanks for providing great articles and resources over the years. I hope you’ll be double as successful over the next few years! Congratulations on the birthday Chris! I remember I found the site when I was first getting into WordPress theme development, specifically converting a Photoshop file into a website. Over the years the site has just got better, and I feel like every article on the site is packed full of useful information and is backed up with strong design concepts, making them all timeless. I personally love the site’s design, I feel that it is one of the best example of “hand-made” design and for now I think the only improvements lye in the addition of more advanced functionality – possible jQuery based? Either way I think the site looks great, and I’m not surprised that you get such a healthy flow of traffic. I particularly like the style of the blog because I feel that it is more design, than code focused. Sure I love learning new code stuffs, but I love the style of posts on here, because they are written by someone with expert knowledge in the graphic design field! I also feel that the featuring of some of your work on TV just goes to show that you are at the top of your game, and learning from you is a privilege because you always come out with something new. Once again, congrats on the anniversary and I hope the blog runs for many many more years to come, and if the quality of the articles is sustained (I’m sure it will be) then I’m sure that it will enjoy even more widespread success. Thanks very much for all the great content – and keep up the great work! Wow, the poster really looks fantastic. also the concept behind it. i wish you all the best for the next years. Hi. Although I only started reading this blog very recently, I have enjoyed every post on here! Keep up the great work! I don’t even remember how I found this site. It was many years ago now. Happy birthday to you, SpoonGraphics, and congratulations on your success as such a popular blog! Hi Chris, congratulations on the third anniversary of the blog! I really like the redesign the blog has been through last december. I am a regular reader since I stumbled onto your blog and a recent subscriber. Your tutorials are detailed and clear. They are my favourite section of your blog. Looking forward to having your blog in cyberspace for another 3 years at least. hugs Chris, we all love your work and your great effort inside Designer’s Community. Thanks! Big Congrats on your 3 years Chris. Great looking poster as well! I can remember coming across your blog when I first started. Your tuts were always very helpful and insightful. Look forward to future posts. Love all the inspiration of your blog! I’ve never used Illustrator but still love your examples and explanations. Happy 3rd Birthday! I would love to win a poster for my daughter and her two children. Her household of “3” recently moved into a new apartment and this would be wonderfully inspiring on their wall. Congratulations Chris for your fabolous blog!!!!!!! Awesome website, great tutorials, blogs, inspiration & tweets! Keep up the good work! Happy brithday. Love your work! always admired your skills and dedication to this site. congrats Spooner! I can’t remember exactly how I came across the site in the first place, but I added it to my RSS almost right away and enjoy subscribing very much. Happy Birthday! Been following for almost a year now! Definitely at the top of my list for design guidance. happy birthday! i found you guys through my google reader…hooked ever since! Been a reader since you first started (or close). Congrats on your third birthday! rlly great work!!!! i <3 your blogg!!!!! WoW just amazing!!!!! 0.o i love your work!!!! I’ve been checking in to both of your design blogs now for about a year and stubled upon it by searching for retro poster ideas and found your poster tutorial. On numerous occasions, one of your tutorials has given me an idea or the inspiration to either start a new project or complete one I was having trouble with. The attention to detail you put into your tutorials is amazing. My favorite blog post has definitely been the Behind the Scenes video for the 2009 wrap-up, it was great to see all that goes into setting up something like that, but also hilarious to see the outtakes. You’re a pretty funny dude. Happy 3 years! Hey Chris, I must say that you’ve really inspired me lately. Congrats on your 3rd year with the site and I wish you many more creative and inspiring years with it. I enjoyed making the poster, with lots of new insight into Illustrator and Photoshop gleaned along the way through experimentation. I needed to find more help with Illustrator, so i found you about 6 months ago…Hooray! This site was the basis of me learning tutorials when I was starting with photoshop. Ive gotten a lot of inspiration from here. thanks man and happy bday blogspoon! This blog has been an excellent addition to my few bookmarks that I have for design inspiration. It keeps me going in the right direction, and it’s as well rounded as I like my projects and ideas to be. It’s one of my favorites and I love it! Love this blog. Always a welcome way to start the day by reading your posts. The poster is hot by the way. Thanks for what you do!! woo hoo. keep up the good work. happy birthday. Looks great! Thanks for the tutorial. I love this site. I hardly subscribe to RSS feeds, but your tips have been some of the most insightful, teaching techniques that are hard to find but used frequently in modern design. I found this page playing leapfrog through other pages while I was designing for the World of Warcraft Magazine, looking for inspiration. For text treatments. Thanks for providing such awesome tutorials! I think I came about on your site by somebody posting links on people you should follow. Out of all of those you are one of the top ones. Thank you for what your provide. I’ve been an avid reader for years, and recently made the decision to become a premium member to support your efforts, and to have access to play in the ‘restricted’ area. The poster is rad, and the tut to go with it was fun to read. Thanks for everything you do, and for your contributions to the great “Smashing Book” from Smashing Magazine, et al. Happy birthday! Been faithfully reading your blog since I discovered it a couple of years ago. Can’t pinpoint any single favourite post, have liked everything so far :) Thanks for doing this! Hey Chris, happy blog birthday ! Bueno, espero que el contenido de este blog sea como siempre, interesante y genial, este en ingles o no el blog, recibes visitas de diferentes parte del mundo. Este blog no es solo una pagina web más de las que hay en internet, este blog es desde todos los puntos de vista, un medio en el que jovenes diseñadores pueden inspirarse y desarrollar su creatividad. Es algo que con cada post hemos desarrollado. Te deseo mucha suerte, aun faltan más años por celebrar!!! I really like this piece. I might try some of these techniques! Happy Birthday as well. Continuously reading the blog, and your twitter, and can’t thank you (and all the other great bloggers) enough for showing me the best ways to solve the problems of design. Happy Birthday! I’ve been following this site for about a year now, initially found you on Twitter. Keep up the good work! mmh, i found this site while looking for tuts to improve my (noobish) skills during a very very cold night last winter. I can still remember it was snowing!!! I found this blog from your twitter and I like it very much because they teach me how to write, rethinking and painting on photoshop illustrator. Thank you hope you read my comment that mean you make me to can find a money by using some tutorial and applied in my work. thanks and keep on going! As a relative newcomer to Adobe Illustrator i’ve found Spoongraphics an invaluable resource in making headway with illustration. I also take more notice of designers with slight beards. Awesome and happy birthday to blog Spoon graphic! Ur blog is awesome! Wow.. what an achievement, Chris. Now doubt you are the best :) I hope to see SG grow even larger in the future. I found your site a while back now. I can’t remember if I was looking for a tut or some inspiration, but I stumbled across it and have kept coming back for more. It has been a constant and reliable source for inspiration and I have kept learning new methods and techniques. Spoon Graphics always manages to make it into my research sheets at Uni and inspires me no end. Been following your posts for a long long time Chris! Was recommended to follow you by Elliot Jay Stocks, and was really glad I did. I think I’ve completed a good, 5/6 projects with the help of your tweets and blog posts! Keep on rocking Mr.Spooner – thank you and well done! Your stuff is great. Just wondering if you have got any more work by blogging? Don’t know if this has been your goal, but it would be interesting to know. I honestly can’t remember how I found spoon graphics, pretty sure it was via a goggle search for some tutorial or other! I always admire your work and only wish I had your skills ;). Great Job, loving SpoonGraphics :). Thx for the interesting post the last years. Thx for the interestings posts the last years. Maybe 2 years ago i found you, booked and never go back because i forgot it! But than a year later i just found it again and i feel like a lucky person! This site is going to be more and more awesome so well im going to be a new subscriber than! You are seriously motivative person. GJ! I actually found this site today, not sure if I’m too late for the contest but a comment is worth placing anyway. I was actually searching for some vector packs so I could use them to learn a bit more about Illustrator, what it can and can’t do etc. This site is one of the few that have been helpful and for that I am grateful. You seems to have a bunch of people visiting so all I can say is keep up the good work. Im hooked to spoongraphics ever since I saw the portfolio on smashingmag. Good flow of articles. I recommend it ever since. Nice one Chris, this is such a great site for inspiration and combined with Line25 they make a really useful tool for getting through university projects. So thank you for hanging about for three years, I look forward to reading more posts on both sites. Congrats Chris on the Big 3..
And very nice poster though. it reminds me a bit of the Dutch artist Jan Schoonhoven. Congratulation for 3rd year anniversary! I’d love to recive this Poster! It’s a really nice one :) Gongrat! Great design! Thanks for the tutorial–again. I’d love to win a poster – would go great on my new office wall that’ll I’ll be setting up this weekend (moving out on Friday!). Really an achievement worth celebrating. I have been following your blog and your valuable tweets for a year now. You and Callum Chapman are the guys who can inspire freealncers like me to find more avenues to show your skills and earn more. I am also a freelance web designer and developer for the last 6 years and had done around 375 big and small projects so far. The looks of your blog are outstanding and your blog provide such a valuable insight into new developements everyday. I was more or less working in flash/xml and html/css. When clients started asking for wordpress services I followed wordpress articles and learned the tricks and blog.spoongraphics.co.uk/tutorials/how-to-build-a-custom-wordpress-theme-from-scratch is one of my favourite as it first helped me learn the trick and then earn money from it. After learning it I grabbed aorund 5 jobs for themes alone.